The inner lining of the uterus is called the endometrium. This mucous membrane changes throughout the woman’s menstrual cycle. It becomes a proliferative endometrium before ovulation occurs as it develops into a thick layer that is rich with blood vessels to prepare the womb for pregnancy. If fertilization does not occur, the endometrium is shed, which leads to menstrual bleeding. The layer of tissue lining of the inner side of the uterus is called the endometrium. It provides a suitable environment for the implantation of a fetus. However, if pregnancy does not occur, this lining is shed off, resulting in bleeding or menstruation. The monthly shedding of the endometrium is followed by the growth of a fresh layer that prepares an environment for implantation if an egg is fertilized. A woman’s menstrual cycle has two phases: proliferative and secretory. The proliferative phase occurs under the influence of the hormone estrogen, which stimulates endometrial growth and thickening. During this phase, the proliferative endometrium undergoes cell multiplication and tissue growth. If ovulation occurs, the corpus luteum (yellow body) secretes a hormone called progesterone, which makes the endometrium thicker, creating an ideal environment for implantation of a fertilized egg. This is known as secretory endometrium phase. 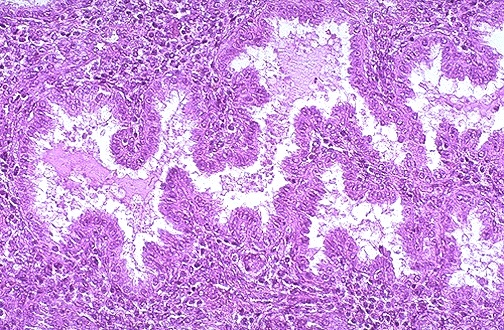 This image shows the microscopic appearance of a normal proliferative endometrium during the menstrual cycle. This phase is variable in length. During this phase, the tubular glands, which have columnar cells, and dense stroma proliferate and thicken, following the shedding off phase from a previous menstruation. 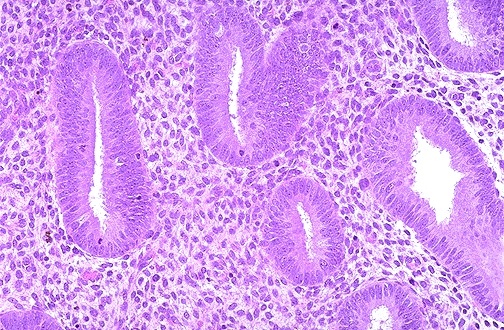 This image shows a microscopic view of a normal secretory endometrium. There are large tortuous glands filled with secretions. This phase occurs on a 14-day course, which leads to either menstruation or implantation of a fertilized ovum. At the time of perimenopause, hormone levels fluctuate. Because of the irregularity of hormone production, endometrial growth becomes irregular, leading to irregular cycles. This is what some people call disordered proliferative endometrium, which simply implies that the growth of the lining of the uterus is not regular, nor is the lining shedding off regularly. This does not necessarily mean malignant changes are occurring. Another potential cause of disordered changes in the proliferative endometrium is the use of birth control pills like Loestrin 20. This may be corrected by taking cyclical hormone therapy. If not corrected, this condition may progress to abnormal thickening of the endometrium (endometrial hyperplasia), one of the factors that increases your risk of developing endometrial cancer. However, this is rare, but it is important for you to keep hypertension, diabetes, and weight under control to avoid increasing your risk. The first phase of the menstrual cycle is the menstrual phase, which is the beginning of the uterine cycle. During this phase, the thick uterine lining sheds off, causing bleeding as it separates from the uterus. This phase usually lasts from 3 to 7 days, with menstrual flow being less on the first day, increasing during the 2nd and 3rd day and gradually tapering off on the 4th to 5th days. Menstruation occurs due to the withdrawal of hormones (estrogen and progesterone), causing the endometrium to shrink and die, thus leading to its separation from the uterus. After menstruation, proliferative changes occur during a period of tissue regeneration. The endometrium repairs itself and it becomes thicker.New blood vessels develop and the endometrial glands become bigger in size. The stromal cells are arranged in a compact manner. At the end of this stage, around the 14th day, the proliferative endometrium is about 2-3 mm thick. The secretory phase begins soon after ovulation. Progesterone production is increased and the glands increase in size as they become secretory. Initially, secretions collect in the glandular cells, but by the 19th - 22nd day, secretions are pushed out of these cells and into the endometrial cavity. The secretion consists of fructose, glucose and glycogen. It is meant to supply nutrition to the fertilized ovum in the uterus. Can Your Tubes Come Untied?